I will be the first to admit that this is something I struggle with. As much as I know certain things will benefit me, it’s hard for me to do it when I just don’t feel like it, when I would rather relax than exercise or write or wake up early. As I continue to push myself to be a better person and a better writer, self-discipline is in the forefront of my self-exploration. –Journaling: Once I get into bed, before I do anything else, I do that day’s self-exploration entry, my gratitude journal, and my bullet journal. This usually takes about 15 minutes total, but I always feel so much better once it’s done! –Reading: This one I’ve had down since I learned how! After my journaling it is reading time. I usually read about 7-10 hours a week for pleasure. –Bible Study: This is new for me in the last few months, but as a new Christian I am committed to learning. I’ve taken on the task of reading through the entire bible. To tackle this I read a few chapters every day or before bed. –Family Time: This one is easy. I have a three-year-old and all I want to do when I get home from work is hang out with her. She’s so entertaining, funny, sweet, cuddly, and crazy. It helps me to unwind from my day and have a little fun. –Writing: I’m just now this month getting back into writing on a regular basis, but it was like riding a bicycle. I’ll admit that I do not write every single day as many authors suggest, but I do write about 5-8 hours a week, which results in about 5k-10k words. – Exercise: This is my number one hate to do but need to do item. I know it’s good for me. I know I can accomplish it in a short amount of time a day. Yet still I convince myself I don’t have time or that it’s not worth it. I’m trying to get in the habit of doing yoga and squats in the morning. Luckily, my metabolism is still kicking strong so I don’t feel I need to hit the gym hard for hours to stay in shape, but there are areas I would like to work on and yoga helps to put me in the right mindset. I did some this morning after five days of not doing anything. Let’s see if I can keep it up tomorrow! –Waking up Early: I really don’t need much time in the morning to get ready, but it’s nice not to be rushed. I know this. And yet I still hit that snooze button multiple times before I make myself get up and rush through getting ready and getting Charlotte ready. I’ve found my optimal time to allow myself in the morning is an hour and a half. This gives me time to get up, make coffee, yoga and do squats, sit down for a few and drink my coffee and read, get dressed, get ready, get Charlotte up, get her ready to go, pack a lunch for work, gather my stuff, and get out the door. It feels great every single time I do it and yet when that alarm goes off my knee-jerk reaction is “NOT YET! SNOOZE! SNOOZE!” Today I woke up at 6am, giving me two hours. I wasn’t rushed and got everything I wanted done. Here’s hoping I can do the same tomorrow. Keeping a Consistent Work Schedule: Since I can basically make my own hours, it’s hard for me to stick to the same ones each day, but when I have a steady routine going I always feel better. I’m going to really try to stick to the hours I made for myself instead of waking up late multiple times in the week and then having to stay late to get the hours in. –Cleaning: I just plain don’t enjoy it. I hate doing dishes the most, but laundry isn’t far behind. I really need to push myself to do these on a consistent basis. I think if I made a cleaning schedule where I can spread it out throughout the week instead of trying to cram everything into Saturday, it would make it easier for me to tackle and get done. 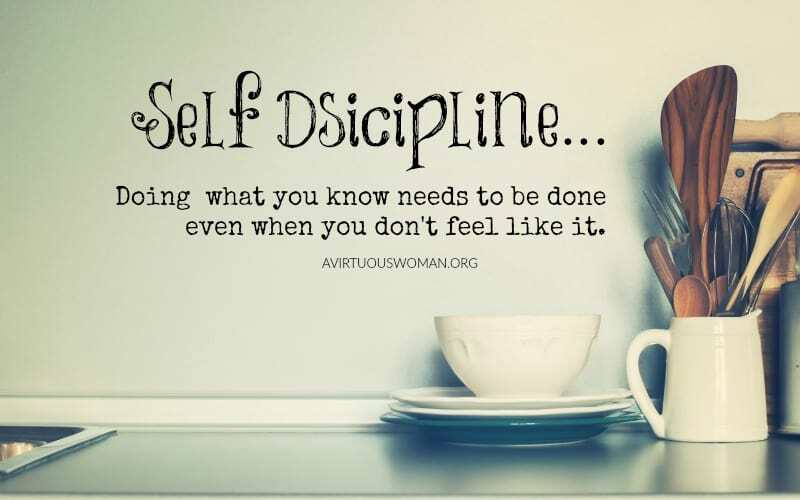 What self-discipline do you struggle with and what are your tricks for overcoming it? Let me know in the comments section below! Previous postFantastic Beasts 2: The Crimes of Grindelwald Trailer is Out! Very nice and true. However, the most difficult part for me is to sync up the free time and the urge to write. That used to be me too! I just wanted to write every spare minute I had. I would get off work, spend time with my daughter, and the minute she went to bed I would write for hours until it was time to sleep. But eventually I got burnt out doing that. All I was doing was working, momming, and writing. I eventually had to give in to my other interests and spread it out evenly. Now I will write an hour or so a day about five days a week. Much better balance for me being a full-time working mom. That’s awesome you have such a strong passion for it though! Run with it, for sure!